Did you know about 9 percent of trips in Flagstaff are made by bike, which is much higher than the national average of just .8 percent? During Bike to School and Work Week, which runs May 20-25, you are encouraged to contribute to that high statistic by leaving your car parked and dusting off your bike for your work or school commute. Participate in various fun events throughout the week to celebrate bicycles and the biking community. 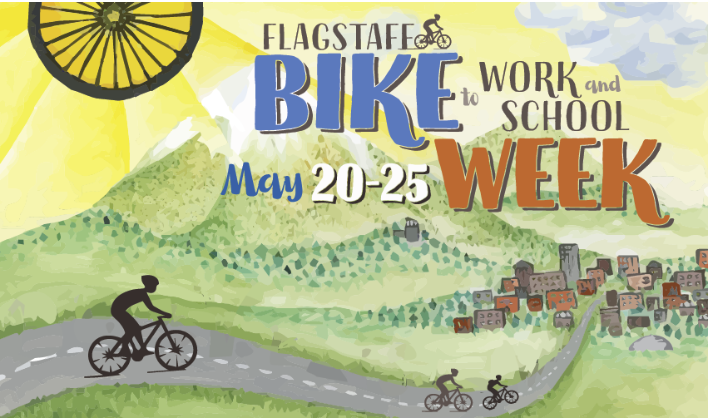 Shop the Bike Bazaarin Heritage Square, take advantage of sponsored breakfast stations across Flagstaff, conquer the Lowell Observatory Mars Hill challenge ride or take it easy with Bike to Beer and be entered into a raffle! For a full list of events, visit Flagstaff Biking’s website. Raffles will be running all week long. The more days you ride, the more chances you have to win! Those who plan to park their bike on NAU’s campus must pick up a green tag for their bike to prevent accidental collection during the annual abandoned bike roundup.